Wow, what an absolutely remarkable post! This time my friend Shirley in Birmingham beat me to it, Hallelujah! 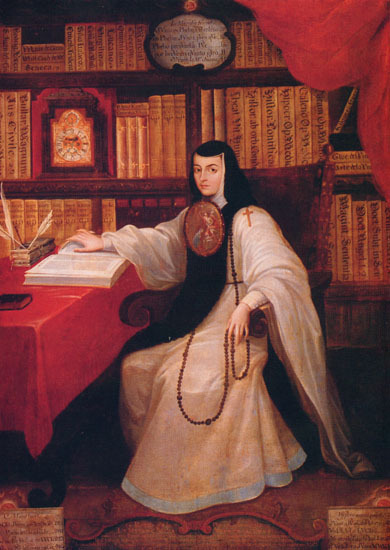 Thanks, Trudie, I spent a long time working on this post -- longer than I planned, because I became so fascinated by Sor Juana. I find her to be an especially positive role model. Sometimes I feel upset that so many official saints died violently, and I am glad that Sor Juana had a long life and natural death. I don’t understand what you mean “my friend Shirley in Birmingham beat me to it.” ??? This post was so inspiring, my favorite one I think. I saw Odaly's Nanin's incredible play "The Nun and the Countess." 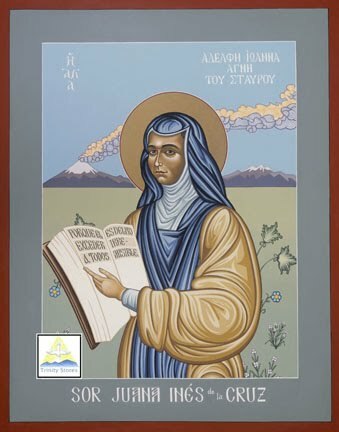 To me, her life exemplifies the idea of lesbian sainthood, what elevates, inspires and transforms women across the centuries. In Nanin's play, the countess and Sor Juana are definitely portrayed as lovers, intellectual compatriots and passionate friends. P.S. For another book that contains Sor Juana's poetry, take a look at "The Essetial Gay Mystics" edited by gay mystic and teacher Andrew Harvey. You'll find a wealth of other spiritual leaders, poets and sages in this book as well. It should be on all bookshelves in EVERY lesbian and gay home worldwide in my opinion. In Tapachula, Chipas, Mexico there is a wonderful Guest House named Casa Mexicana...I´ve stayed in the beautiful Sor Juana room and intend to get back soon...it´s haughtingly romantic (as is the rest of the hotel)...the whole place is poetic. Really nice. Well, now I've ordered another book referenced on this blog! This is getting to be a major source of my reading material! By the way, I've finished reading the novel about Perpetua that you linked. Although the book doesn't suggest a lesbian angle, it is a wonderful and inspiring story about the early days of Christianity. I'm as delighted with it as I was with the original post and icon. Sor Juana is such an inspiration! Thanks for all the comments and recommendations. I also got a Facebook comment about an epic novel called “Hunger’s Brides” about Sor Juana. Trudie, I appreciate hearing how the Perpetua novel was, and am glad to be providing more material for your reading list. I'm just about to begin reading a couple of books on Sor Juana-- her writings and a novel based on her life. Sometimes, you read about the life of women like that, and it just amazes my lesbian soul. Think of it, a lesbian had the largest library in Mexico in the 17th century! I’m sure that Sor Juana would be pleased that she is inspiring so many women to read more books. Thanks, Turtle Woman, for sharing your thoughts and your literary journey. Well, now that I've finished reading the novel Sor Juana's Second Dream, I've got to give a quick review: Powerful, powerful, powerful! And -- folks, we think we've got it bad with the repressive patriarchal hierarchy? If this story is true to life, and I believe it is, besides being a masterful piece of writing, all I can say is, we've come a long ways, baby. Whenever I feel frustrated about the narrowness of the fundamentalists again, I'm going to thank God I'm in 21st century America, not seventeenth century New Spain! Trudie, thanks for your report on the novel “Sor Juana's Second Dream.” I’m glad to know that it is a powerful book illustrating how far we have progressed on women’s rights. I haven’t heard from you for a couple weeks, so it’s good to know that you were still out there, reading away about a lesbian nun! I gave a T-shirt with the Sor Juana icon to my life partner Audrey for her birthday recently. She loved it and plans to wear it to a LGBT Pride celebration next month. Is this a sexual Jesus? Happy Easter from Jesus in Love Blog!